Once again, President Obama emerged from his permanent sabbatical on the war on terror to inform us, in a bizarre address from the Oval Office, that he has things firmly under control and there's no need for us Americans to be concerned. Excuse me if I'm not comforted. Obama has made quite clear that he is blind to the threat that radical Islam represents to America and the rest of the civilized world. He obviously believes that Islam produces no more or worse terrorists than any other religion or cult and that it is wrong to focus on the radical strain of Islam because it leads to discrimination against other Muslims -- discrimination he seems to see under every rock. We've repeated to the point of cliche that to effectively wage war, one must identify his enemy, and no one can rationally dispute this. But Obama can't bring himself to identify radical Islam, Islamism or Islamic terrorism as our enemy. His blindness may be from his sentimental childhood attachment to Islam. It may be that his leftist ideology compels him to see conservatives, Republicans and Christians as America's true enemies. But whatever it is, he is crippling the United States in this war and is making us increasingly vulnerable. 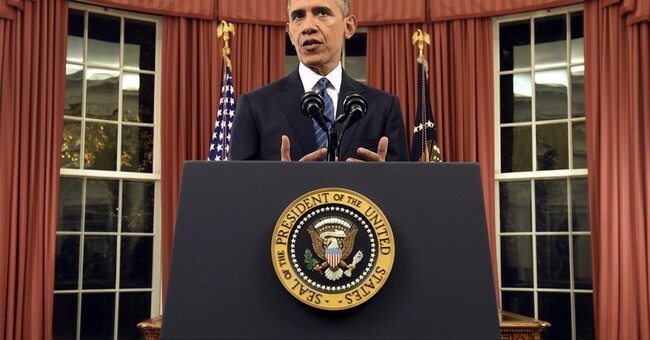 You could tell from Obama's body language and his hurried tones that his heart was not in his speech. He didn't want to be there. I suspect his advisers pressured him to make this speech because he had to do something to deceive the American people into believing that he is actually engaged and that we can trust him to lead us in this war. But he convinced no one with that lackluster address, in which he gave empty assurances that we are following a strategy that we all know to be nonexistent. It's easy to recognize when Obama is passionate about something, such as when he talks about alleged Christian atrocities against Muslims hundreds of years ago during the Crusades, gun control, health care, income redistribution or global warming. But with the exception of gun control, those issues were not part of his speech, so he was noticeably indifferent and disengaged. It took him four days to respond formally to the greatest terror attack on our soil since 9/11, and he acted as though he was just now devising a strategy to deal with Islamic terrorism, except that he actually didn't. He still didn't identify Islamic terrorism as the enemy. Instead, he was careful to narrowly define our enemy as ISIL, his annoying acronym for the Islamic State group, which most Americans refer to as ISIS. Obama is so adamant about protecting the image of Islam that he bends over backward to remind us that there is no conclusive evidence that the murderous Islamic couple were acting on behalf of the Islamic State. It is amazing that he thinks that denying this link is somehow reassuring to us. To the contrary, we have more reason to be concerned about threats to our homeland if these two jihadis were radicalized and acting solely on their own, though that appears to be unlikely. It's hard not to believe that there is something in the actual religion of Islam that motivates a disturbing number of its adherents to wage war against others inside or outside the religion of Islam who will not submit to their view of it. Obama can talk until he's blue in the face about how peaceful the religion is, but clearly, many Muslims worldwide don't subscribe to his view, and this has been the case since the inception of the religion. This doesn't mean we should in any way discriminate against Muslims, most of whom, of course, don't subscribe to the radical version. But it does mean that we can't turn a blind eye to the radicalized elements of their religion, which are not limited to al-Qaida or the Islamic State. Try Boko Haram, for starters. It also does not mean that every time there's an Islamic act of terror, our putative commander in chief should rush to the lectern to assure Muslims that we are not at war with them and lecture the rest of us not to mistreat Muslims -- which we are not doing. Obama is obviously far more interested in creating this straw man to knock down than in defining and destroying our enemy. Obama keeps telling us not to give in to fear, but it's not so much fear of terrorism that is haunting us as it is the realization that our commander in chief is doing nothing to combat the threat. His entire tenure in office has been a saga of a president usurping and abusing authority, yet the one clear constitutional duty he has -- to keep America safe and secure -- he abdicates with striking disgrace. So no, President Obama, we are not afraid that we are incapable of defeating the enemy; we are mortified that we have a leader who won't lead and who has created a vacuum in the world and in the United States where our enemy can flourish. President Obama, you underestimate the American people just as egregiously as you ignore the reality of our enemy. Please don't insult us anymore with your lies that you have a strategy to defeat an enemy you won't even acknowledge. No one with half a brain believes you anymore.